After the cooking presentation at the Botanical Gardens Spring Festival today, I had many requests for the recipe for the hop yeast based bread I took along to serve with samples of the preserves we made. The recipe is courtesy of Mavis Beattie of New Norfolk and is one that has been in her daily for generations. The bread has a really good crumb and texture, and it keeps fresh for longer than an average loaf of bread, no count courtesy of the potatoes in the yeast. 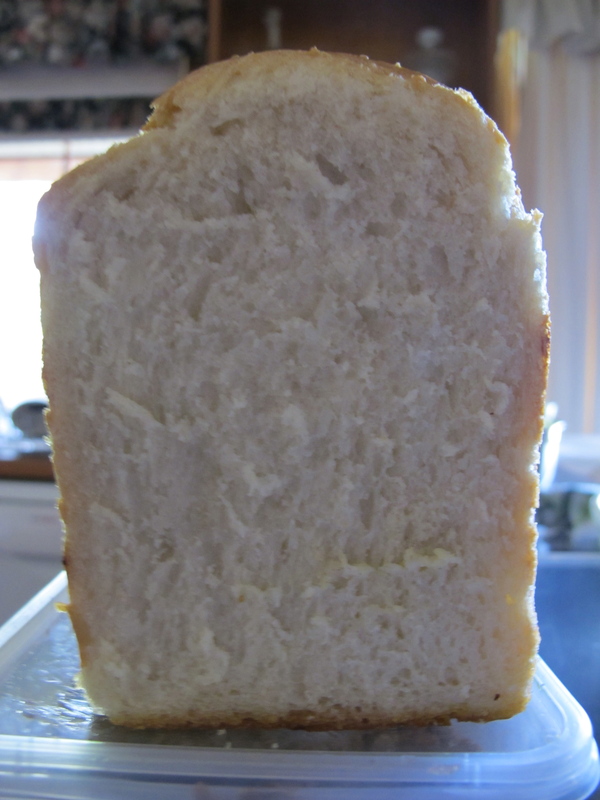 This is a photo of the leftover loaf I cut in half when we arrived home. Quite remarkable really that it survived so well, considering the container it was travelling in was turned unceremoniously upside down as we rounded a corner. I’m also posting the recipe for Labna, also much requested. I use a 2 litre plastic lemonade or tonic water screw top bottle. It takes the pressure better than a glass bottle. Combine yoghurt, lemon juice, salt and olive oil in a bowl and mix well. Rinse a piece of muslin in boiling water. Drain, allow to cool, then lay it out, double thickness, in a large colander in a bowl. Pour yoghurt mixture into this, and tie top to form a bag. Hang this bag over the bowl and leave for 2 days in a cool place. If you live in a warm climate, or in summer in cooler climates, this may need to take place in the fridge. Roll the resulting yoghurt cheese into walnut sized balls and place in a sterilised 1 litre jar. Make an oil mixture of 85% sunflower oil and 15% olive oil, estimating how much will be needed to cover the balls. Pour over, making sure there are no air pockets). Seal and store in the fridge for 2 to 3 weeks. NOTE: always be sure to keep the yoghurt cheese, even minute portions, covered by the oil). (i.e.. when you remove any of the balls, wipe clean any smears on the inside of the jar and be sure that the balls remaining are totally submerged in the oil).